“If there was ever a good time to consider a new investment approach,” an advertisement for a mutual fund company proclaimed in a recent issue of a financial planning magazine, “it’s when the old ones have proven so fallible.” For a second, I thought that they had finally given up on the tired buy-and-hold (B/H) approach. It turned out they were just promoting a new kind of index fund. Buy-and-hold remains deeply entrenched in the financial planning community, despite many of the flaws my previous articles have illustrated. Although many financial advisors suffer dearly from their B/H practices, they are reluctant to change their approach. Who dares to challenge investment sages like Bogle, Siegel, and Malkiel who emphatically support this long-standing investment principle? Academic research studies overwhelmingly endorse B/H. How can they all be wrong? Perhaps the investment scholars and researchers are right to advocate B/H, but for the wrong reason, as I will explain later. But first, let me digress to respond to some of the feedback my previous articles received. I am gratified to learn that many readers are able to replicate my results. My research is only credible if it passes peer reviews. A couple of readers, however, had difficulty reproducing my exact numbers. I use Professor Robert Shiller’s S&P500 Index primarily because his data is accessible to the public, so that my calculations can be checked. But Professor Shiller creates his monthly index by averaging daily closing prices. If you use actual daily or monthly closing prices, you will get different results. Several analysts also inquired about the actual implementation of the Moving Average Crossover (MAC) system. 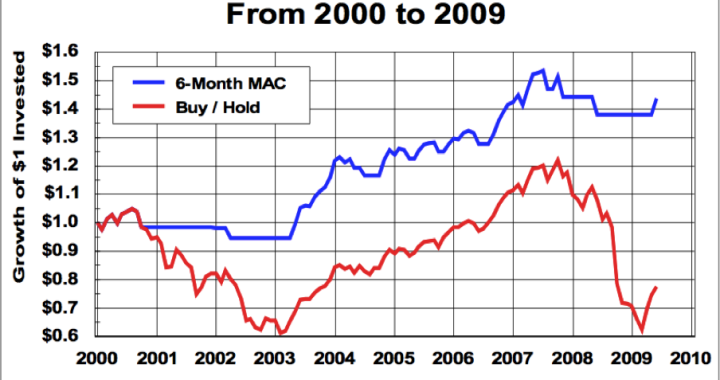 For the record, it is not my intention to promote the MAC system as a trading tool. There are many trading systems used by active managers with proven track records. 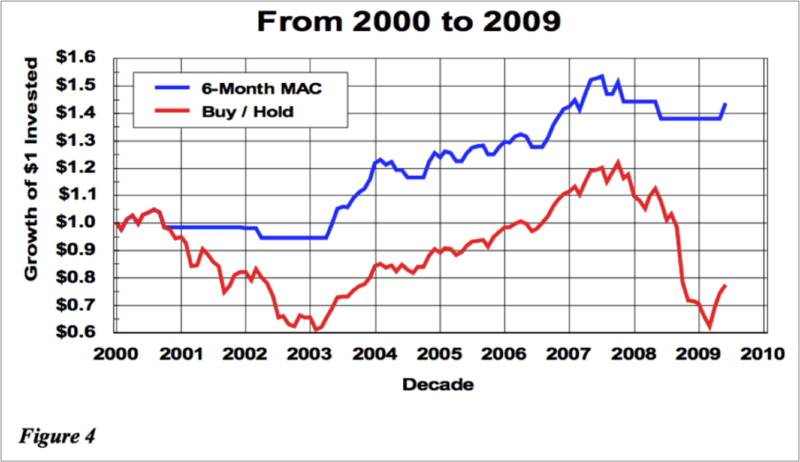 I use MAC as a demonstration to challenge the popular notion that no one can beat the markets in the long run. In science, it only takes one counterexample to invalidate a principle, no matter how well-established it might be. Establishing a way to implement active investment management systems into a business practice exceeds the scope of my articles. For those planners new to the field of rule-based trading systems, my advice is to work with a reputable active investment firm or to use experienced consultants. It’s not a do-it-yourself project. Implementation considerations aside, let’s turn to a more detailed analysis of the MAC system, and see how it compared to B/H pre- and post- the Great Depression, as well as during each of the last 14 decades. The effectiveness of the 6-month MAC system is illustrated graphically in Figure 1. I present the 138-year history into two plots of seventy years each for better visual clarity. All the buy and sell signals are superimposed on the S&P500 Index in two colors. The red segments (sell) depict periods when the Index was below its 6-month moving average; and the green (buy), above. The blue curve shows equity accumulation from three contributing factors: capital gains resulting from MAC transactions, reinvestment of dividends while in the markets, and capital preservation in cash while out of the markets. A $1 investment in 1871 would have soared to $332,000 in June 2009. By comparison, $1 invested under the B/H approach with dividends reinvested earned only $105,000 over the same period. Note that without reinvesting dividends a $1 investment in the S&P500 Index itself only returns $211 (from $4.44 in 1871 to $938 in June 2009). As we have seen, the 1929 crash gives MAC an advantage over B/H as seen in Figure 1. Several readers wanted to know how MAC would have fared if we removed the one- time impact of the Great Depression. 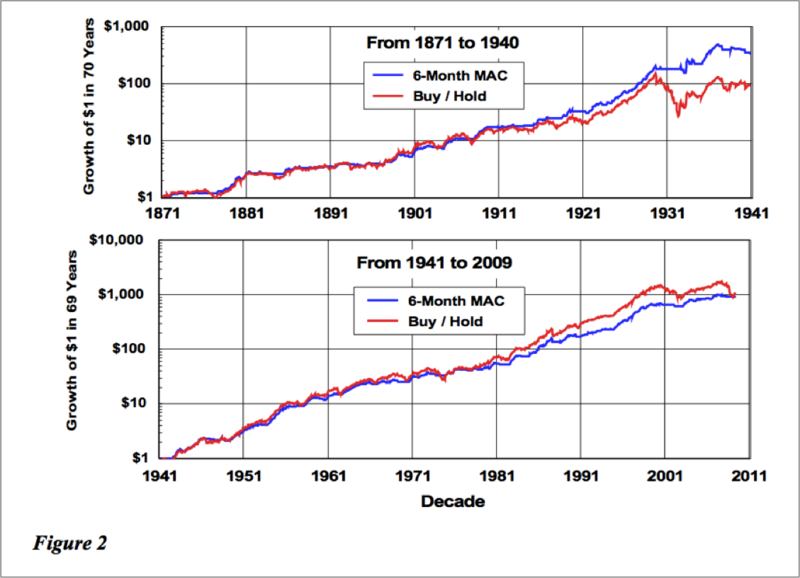 In Figure 2, I show two separate investments with $1 each at the beginning of the two seventy-year periods. From 1871 to 1940, the B/H strategy returned 100-fold and MAC beat it by a factor of five, primarily a result of side- stepping the Great Depression. 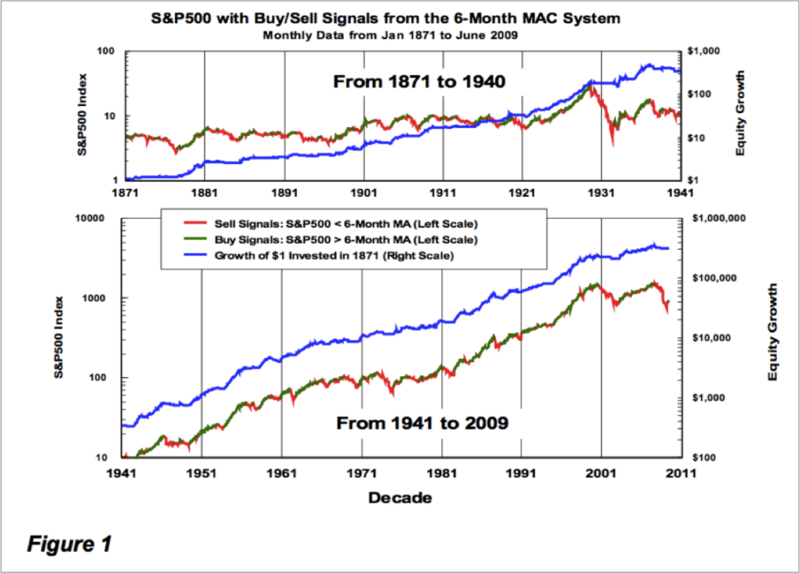 From 1941 to June 2009, without the impact of the Great Depression, both systems gain 1,000-fold and tie at the end. However, B/H outperforms MAC for most of the seven decades. So you may say that B/H is indeed unbeatable, if bear markets like the Great Depression, the Oil Embargo of 1974, the 2000 Internet Bubble, and the 2008 Sub-prime Meltdown can all be ignored. B/H can be considered as a bull market Holy Grail. Let’s examine market history in a different light. In Part 2, I compared MAC’s monthly and annual performance to that of B/H. MAC beat B/H on both counts. But by looking at monthly and even yearly perfromance you could miss the forest for the trees. Examining decadal performance, thought, one gains new insight from a longer-term perspective. Figure 3 shows Compound Annual Growth Rate (CAGR) by decade. The 138 years cover fourteen decades. The upper graph compares B/H to MAC. The lower graph is more instructive, as it shows the net CAGRs (MAC minus B/H). Out of fourteen decades, B/H outperforms MAC in only six, and by small margins. Five of those six decades occurred after 1941. 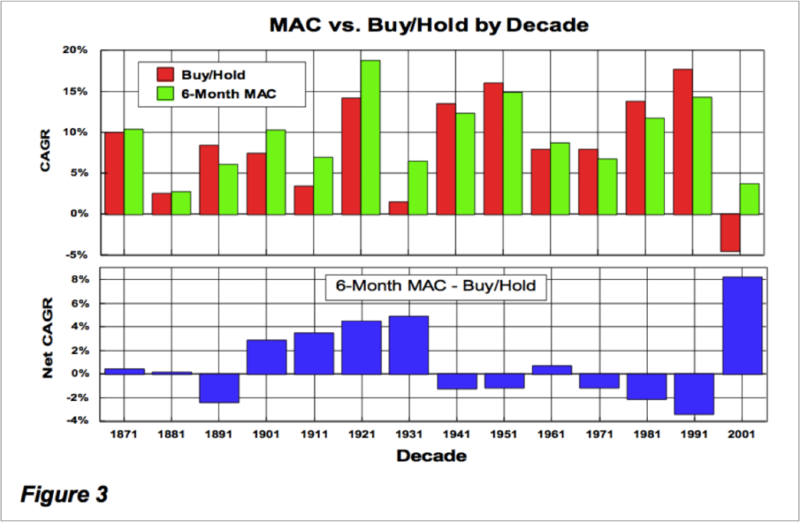 In those decades when MAC outperforms B/H, the margins are quite significant. Finally, for more than a century, the current decade is the only one that B/H has shown a loss, although the current decade is not over yet. I mentioned earlier that researchers are right to endorse B/H, but they do so for the wrong reason. They are right that B/H has an impeccable track record over six decades. But they are wrong to declare B/H as the best way to invest at all times. B/H underperfomed more than half of the time in 138 years. They are also wrong when they justify their argument with theories such as the Modern Portfolio Theory and the Efficient Market Hypothesis. The markets were quite efficient during all bear markets so why didn’t B/H work then? History and simple logic tell us why B/H didn’t work in many decades before the ’40s, why it has worked for so long after the ’40s, and why it has stopped working since 2000. You don’t need advanced economic theories to explain the obvious. After World War II, the West, led by the United States, unleashed the power of the free market system. Capitalism fueled technological innovation, which in turn bolstered global economic expansion. As a result, the stock markets enjoyed the most powerful and the longest advance in human history. The unprecedented secular bull markets skyrocketed 1,000-fold and lasted six decades. All academic research sudies focused on this post-WWII era naturally concluded that no one can beat the markets. The efficient market theories had little to do with B/H’s success. The B/H strategy was the Holy Grail simply because of the secular bull markets. Then came 2000. The markets tumbled and B/H faltered. Researchers who clung to six decades of flawless records with a seemingly sound theoretical underpinning were perplexed. Since bull markets always returned in the past, they waited, only to get hit again in 2008. They continue to hold, wait, and hope. As an engineer surrounded by financial scholars and investment geniuses, I feel like the little boy watching the naked Emperor in the parade. I point out the obvious with no fear of embarrassing myself. President Clinton once said, “It’s the economy, stupid!” I holler, “It’s the bull markets, Professors!” The truth is that B/H works wonders during economic expansions, but it underperforms during economic slowdowns or contractions. If there were no bear markets, B/H would indeed be the Holy Grail! The Modern Portfolio Theory tells us not to put all your eggs in one basket. The B/H strategy calls for holding all your eggs in one continuous “basket” of time. That sounds like a risky proposition to me. Market timing is not witchcraft. It reduces risk through temporal diversification. There are times to hold, and there are times to fold. at bottoms. But it’s effective in preserving wealth in bear markets and accumulating wealth in good times. Now you know why the B/H strategy that worked so well in the past has proven so fallible since 2000. The question is whether you believe the secular bull of the past is likely to return after the current recession is over. If you think that the next decades will not match the good fortune of the post-WWII era, you should start looking for an alternative investment approach. Posted in Trend Following and tagged Buy and Hold, Moving Average Crossover. Very interesting information. I also liked your 3/8/2016 article in the Advisor Perspectives … Measuring Gauges Broken? I’m curious why your charts don’t include data after 2011.